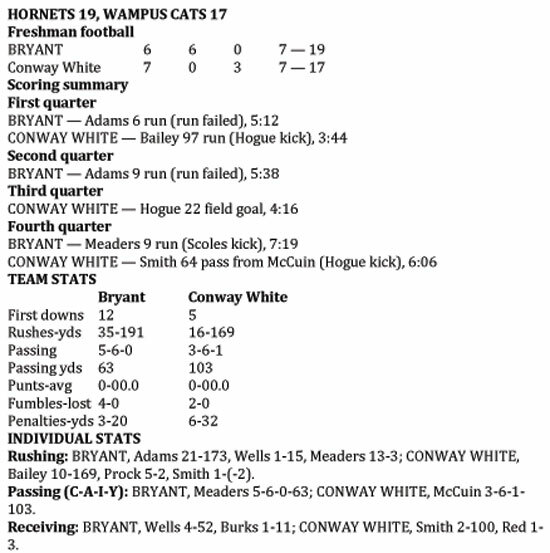 CONWAY — An inspired effort from the Conway White Wampus Cats and the natural inclination to look ahead to a conference championship game against their arch-rivals left the Bryant Hornets freshman team scrambling to escape John McConnell Stadium Thursday night. 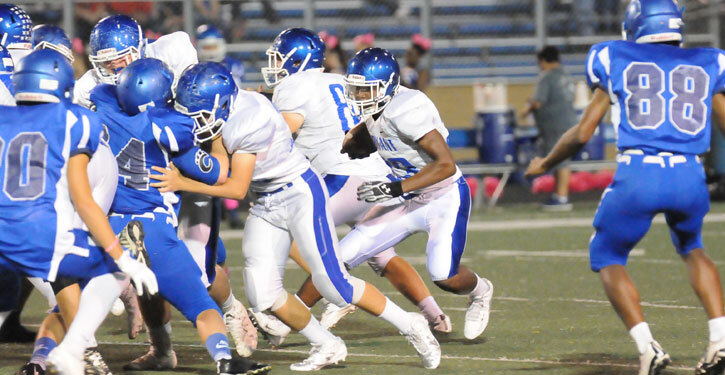 Though they trailed only briefly, the Hornets eked out a 19-17 win to remain unbeaten at 9-0 overall and 8-0 in the Central Arkansas Junior High Conference. The showdown looming over Thursday’s contest will be Tuesday at Bryant Stadium when the Benton Panthers freshman team, 8-1 overall and 8-0 in conference after a 28-6 win over Conway Red, come to call. Ahmad Adams rushed for 173 yards and two touchdowns for the Hornets on Thursday. He’s now gained 1,097 yards for the season and scored 24 touchdowns. Quarterback Jake Meaders completed 5 of 6 passes for 63 yards and ran for a TD. Meanwhile, on the strength of three big plays, Conway White accumulated 272 yards of offense. Of their 103 yards passing, 100 of it came on two plays. Of their 169 yards rushing, 97 of it came on one run. The defensive work for the Hornets was highlighted by a crucial play from Christian Cain just before the end of the first half. On a third-and-16 at the Bryant 18, Cats’ quarterback Nick McCuin fired into the end zone where Cain was trying to cover JVonte Reed who went up to make the grab only to have Cain steal it away as they were falling to the ground. Though the call was hotly disputed by Conway White head coach Trent Mallett, it was ruled an interception. The Hornets led 12-7 at the half. Mallett was also frustrated that twice, his team ran back kickoffs for touchdowns only to have them negated by penalty. But, in each instance, the Cats wound up scoring anyway. 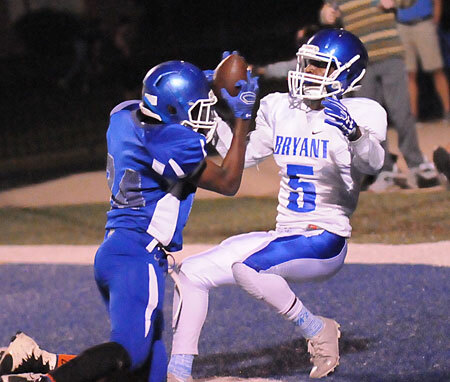 It looked like a typical Bryant night when the Hornets drove for a touchdown on the opening possession. The big play was a fourth-and-1 run of 28 yards by Adams. A play later, Meaders found Gavin Wells for 8 yards. Adams covered the last 14 yards on two totes, scoring from the 6. A bad snap sabotaged the extra point try. Conway’s Shane Smith returned the resulting kickoff 98 yards for a touchdown only to have it called back. 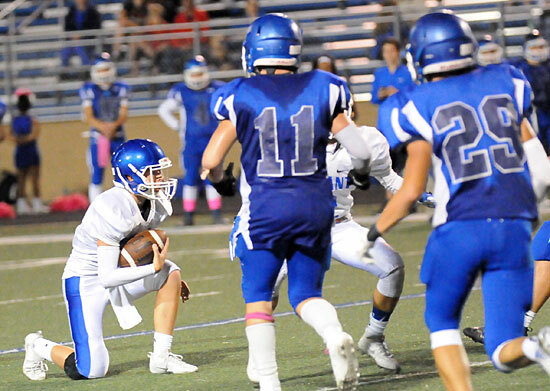 The penalty pushed the Cats back to the 5 and, on first down, Caden Fullbright tackled Smith for a 2-yard loss to the 3. The next play, however, Luke Brewer exploited some strong blocking and set sail on a 97-yard touchdown run. Will Hogue’s extra point gave the Cats a 7-6 lead. Incredibly, it was the first time all season that the Hornets had trailed in a game. And the Wampus Cats got a chance to add to that when a line-drive kickoff ricocheted off of a one of the Hornets’ front-line blockers and was recovered by Daniel Kim at the Conway 46. On a third-and-3 at the Bryant 47, however, Bailey fumbled and lost a yard as Conway White lineman Damian Lopez recovered. Parker Prock got the call for the Cats on a fourth-down play but was enveloped by Bryant’s Catrell Wallace, Austin Bailey and Tye Johnson. The Hornets took over on downs and, despite a 9-yard loss on a snap exchange on first down, surged to a go-ahead touchdown. Adams had a pair of 15 yards to make up the difference after the loss. Meaders, later, converted a third-down at the Conway 20 with an 11-yard keeper, setting up Adams’ second touchdown run from the 9. The Hornets tried to add a two-point conversion but Adams was stopped at the goal line. Another of Conway’s big plays started the ensuing possession. McCuin tossed a 36-yard pass to Smith. Though out-leaped by Smith, Bryant corner William Boyd was able to somehow bring him down, saving a touchdown. 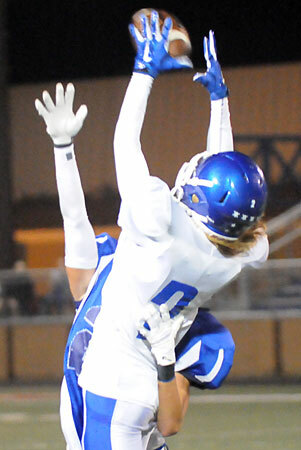 Conway benefited from a pass interference call that converted a fourth-down play and kept the drive alive. From the 9, however, the Cats suffered consecutive false-start penalties ahead of Cain’s big interception. Conway got the ball to start the second half. Bailey had a 50-yard run on a fourth-down play, reaching the Bryant 5 but, again, the Hornets’ defense stood up. Austin Bailey stopped Prock for no gain then combined with David Shifflet and Tristan Sehika to drop him for a loss. A fourth down pass was overthrown as the Hornets pressured McCuin. 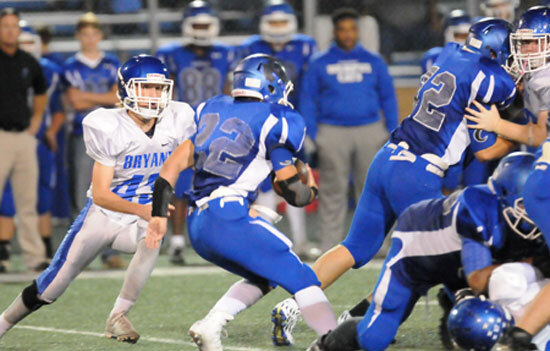 Hogue, however, came on to hit a 22-yard field goal that trimmed Bryant’s lead to 12-10. Daylon Land recovered a squib kick and, on the first of just two second-half possessions for the Hornets, they drove 65-yards for to make it a two-score lead. They had to overcome two losses on the opening plays. Wells caught an 11-yard pass from Meaders but was still short. On fourth down, Wells dropped back to punt and couldn’t handle a low snap cleanly. He picked it up, however, and raced towards the right sideline, found the corner and got the first down at the Conway 49. Two plays later, Meaders completed an 11-yard pass to Jaeger Burks to convert a third-down situation. And, on third-and-2 from the Cats’ 26, Adams powered for 17 yards to the 9. Meaders scored from there. Grayson Scoles came on to attempt a big extra point. With the lead just 18-10, Conway could score and tie it with a two-point conversion. Scoles missed his first try, hitting the right upright. But Conway was offsides and he got another chance. This time, he drilled it to make 19-10 with 7:19 left in the game. Prock returned the next kickoff 79 yards for an apparent touchdown but another blocking penalty negated much of it. From their own 31, however, the Cats scored anyway. Bailey picked up 5 yards then Smith ran under a deep pass from McCuin for a 64-yard touchdown. Hogue added the extra point to make it 19-17. With 6:06 still to play, the Hornets’ offense returned to the field after a touchback and asserted themselves, putting together a game-clinching drive that consumed all the remaining time. They reached the Conway 4 and, after the Cats took their final timeout with :57.6 to go, Meaders took a knee twice to close it out. The drive was sparked by an 11-yard run by Meaders. But, moments later, the Hornets faced a third-and-3 at their own 39. Meaders rolled out to pass and fired one towards Wells down the right side. Well-covered, Wells leapt up and made a spectacular catch to keep the drive alive. Adams, and the Hornets’ offensive line did the rest against a big Conway White defensive front and a stacked box geared to stop the run.